Pilar Jezucher mornnachem formonn martat. Fuddari : Kaklut amchi kor Somia. Sogllim : Kaklut amchi kor. Jezu poile pautti Khursa tolla apttota. Jezucho khuris vhorunk Simanv Sirinev Taka modot dita. Jezu dusre pavtt Khursa soit dhornir apttota. Jeruzaleacho ostorean Jezu khatir roddtat. Jezu tsire pavtt Khursa soit sokla xevttota. 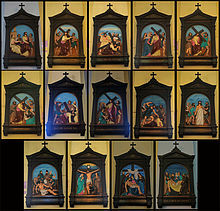 10th Station, Jesus is stripped of his garments,Holy Sepulchre, Jerusalem, Israel: Wooden crosses for self-service. Jezuchem Angvostr sobhemazar kaddun uddoitat. 12th Station, Jesus dies on the cross,Church of the Holy Sepulchre. Golgotha (Calvary). 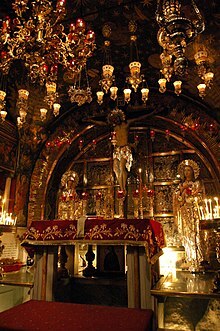 Orthodox Crucifixion altar. Khursache polongar Jezu Aplo prann soddta. 13th Station, Jesus is taken down from the cross,The Stone of the Anointing, in front of the main entrance in the Church of the Holy Sepulchre, Jerusalem. 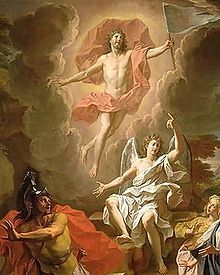 Resurrection of Christ by Noel Coypel, 1700, using a hovering depiction of Jesus. The resurrection of Jesus is the Christian belief that Jesus Christ miraculously returned to life on the Sunday following the Friday on which he was executed by crucifixion. Jezuk Khursavelo denvoitat ani Tache Maichea gopant ghaltat.